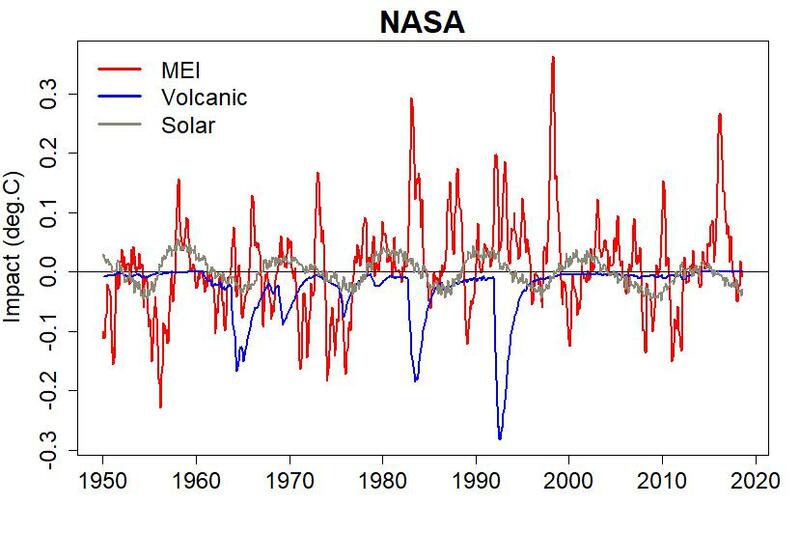 Many things affect global temperature, and the three best-known other than greenhouse-gases those are the el Niño southern oscillation (ENSO), atmospheric aerosols from volcanic eruptions, and variations in the sun. 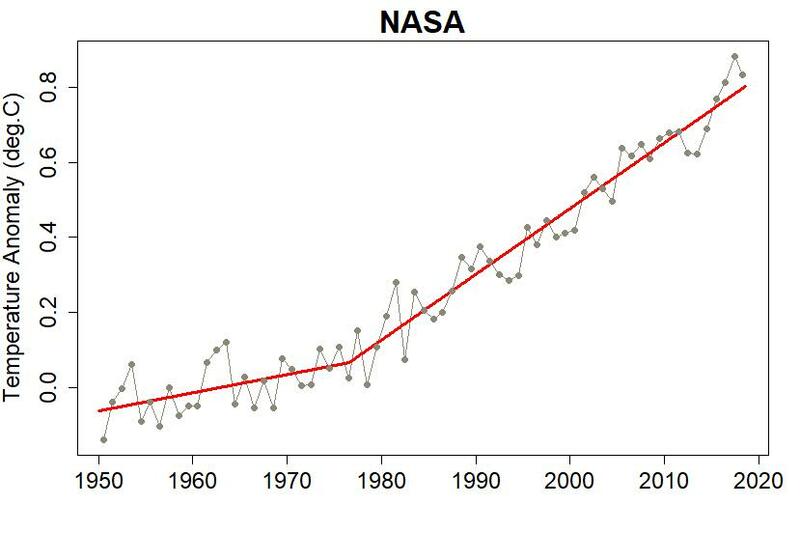 We can use historical data to estimate how strongly those factors affect global temperature. I’ve done so in the past, and by requests here’s an updated version which includes recent data. 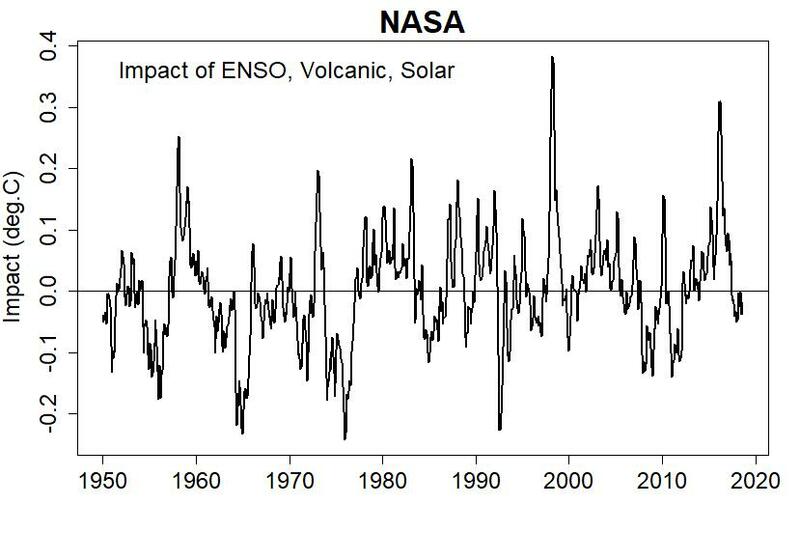 The strongest peak warming due to these factors was during the super-strong el Niño event leading up to 1998, while the peak cooling was in 1976, when all three combinated to cool us off: volcanic eruptions, the cool (la Niña) phase of ENSO, and the cool part of the solar cycle. Before adjustment the estimated trend rate (now) is 1.83 +/- 0.21 °C/century, after adjustment it’s 1.75 +/- 0.13 °C/century; the difference is not statistically significant. The standard deviation (a measure of the amount of fluctuation) of yearly averages before adjustment is 0.094 °C, after adjustment it’s 0.057 °C. That doesn’t mean it has followed two straight lines since 1950, but it does mean we don’t have enough statistical evidence to claim that it hasn’t. I’m also interested in how this looks using data over land areas only. 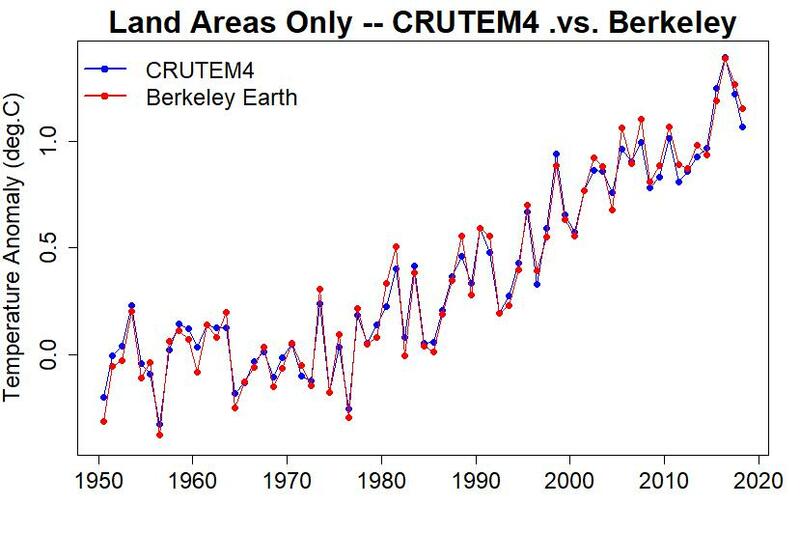 I’ll do two different data sets, in part to show how well they agree with each other, which is partly a response to the recent “study” of Hadley Centre/Climate Research Unit data (the CRUTEM4 data for land areas only) referred to by a reader recently. The “study” calls itself an audit but in my opinion is nothing more than a hatchet job. 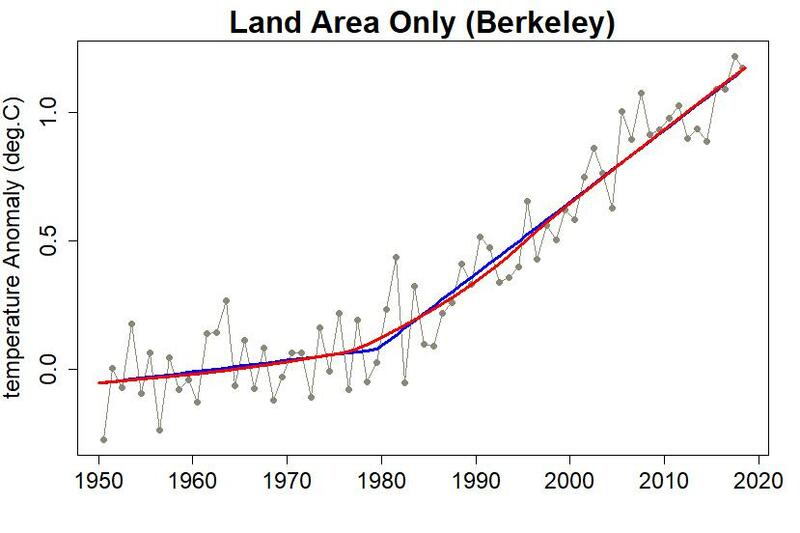 I’ll also use the land-only estimate from the Berkeley Earth Surface Temperature project. An important thing to note is that the rates based on the piecewise-linear fit are really the average rates over each piece, which is why is has smaller probable errors than the rates based on the smooth fit. Important note: wordpress won’t allow me to upload a “csv” file, so I changed the suffix to “xls” to get it there. Change the name suffix from “xls” to “csv” and treat it as a csv. Yes. One of the things that ‘everybody knows’ but most of the time forget to think about is that warming over land is much greater. So, for instance, hitting the 2 C warming mark globally would imply a mean change over land of ~4 C.
The naive always think it doesn’t sound like much, partly because the natural tendency is to compare the change to daily variability, which in temperate zones may easily be 15 degrees, or even much more in drier areas. But, to bring in a personal instance, this summer in mid-South Carolina has been persistently warm, with very few days failing to reach a high of 90 degrees F, from May well into October. I really, seriously, wouldn’t relish a situation where that daily max would be 97.2 F for months on end–nor where the really warm days would be hitting 111.2, instead of ‘just’ 104. At 80% relative humidity, and nominally normal pressure of 1000 hPa, that’s a wet bulb temperature of over 104 F, which carries a serious risk of lethality if exposure is prolonged. The other, larger, factor is manmade aerosols (coal smoke, etc.) though it has a more consistent impact than volcanoes, El Nino, and the Sun. 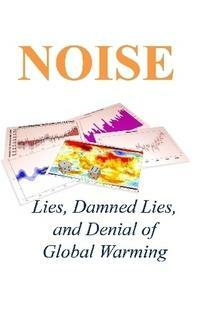 My understand is that manmade aerosols are “hiding” about half of the global warming signal. [Response: Using just the data since 1950 (as in this post), I see little reason to prefer one over the other. A modified lowess smooth (with a good choice of time scale) lies between the two. But using the full data set, I think a piecewise-linear model (with more pieces) comes out preferable to either a high-order polynomial (you’d have to go higher than quadratic) or a “piecewise quadratic (or whatever)” model. I’m also always reluctant to use high-order polynomials because they’re great in the heart of the data, but tend to explode unrealistically near the endpoints. 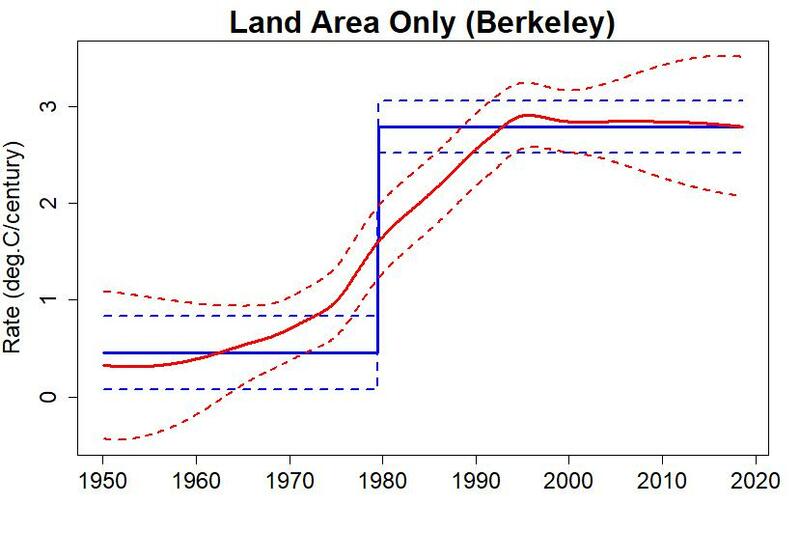 Do bear in mind that the piecewise-linear model was really implemented in the first place to test whether or not there is a *demonstrable* slope change since 1975. Thanks for this exercise. As I was looking at the graph with the 3 natural factors removed, I started to wonder why there is still variation. Presumably, part of the answer is that there are still other variable natural factors that aren’t accounted for. If those could be understood, would we be able to produce a graph of human forced changes that looked almost like a smooth line? 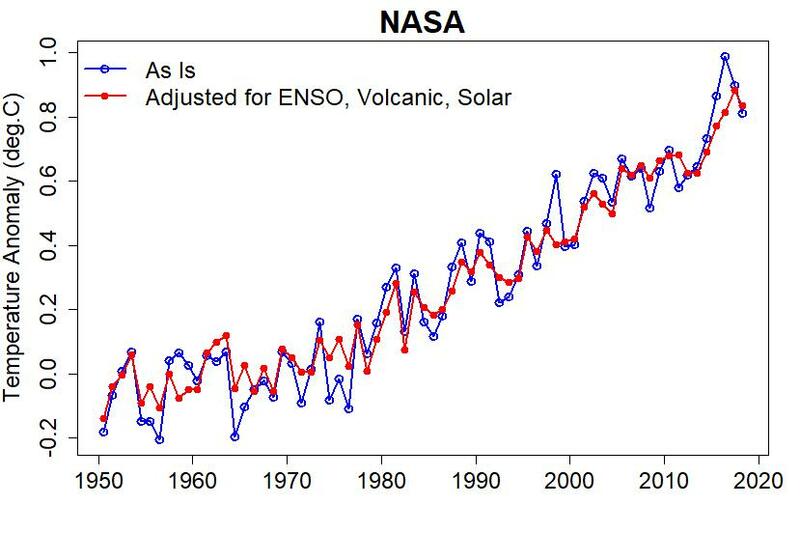 Just wondering if the still noticeable ups and downs indicate a lack of knowledge about the many other natural variables (mind you, it also possible that what we call “natural” might be affected by what we’re doing to the climate). Another thought: if we split out the northern and southern hemispheres, what do the data show? 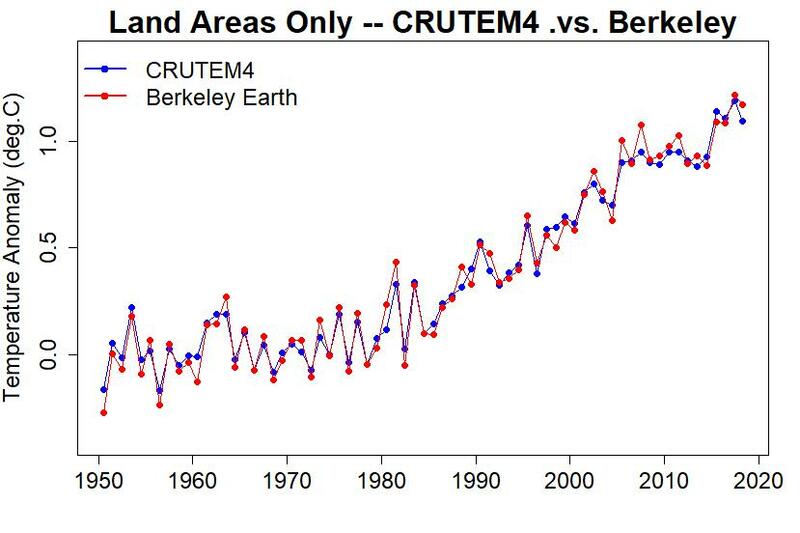 I’ve seen some graphs of this split on GISTEMP and it does seem that the SH warming isn’t as rapid as the NH. I know Michael Mann estimated, a couple of years ago, that the NH had already warmed 1.2C by the base period usually used to represent pre-industrial, so the NH is much closer to 1.5C (and 2C) than is generally reported. I’m not sure how “current” average anomalies are calculated, but, from those GISTEMP graphs, the NH looks to be about 1.4C (on the usual baseline, 1.6C on the Mann baseline) and the SH is about 0.8C (on the usual baseline, unknown for true pre-industrial baseline). So it looks like we could be at 1.1C globally, even on the usual baseline. I’d love to know what scientists calculate the real figures to be. The use of the MEI-index has a disadvantage: This index has a warming trend because it is not corrected for the warming of the ocean. It would be better to use a detrended version of this index (or the ONI-index, which is corrected for the long-time warming in the NINO3.4-region).